At 7:15pm on the evening of 19th July 1912, a bright fireball appeared in the sky above the town of Holbrook in Navajo County, Arizona. 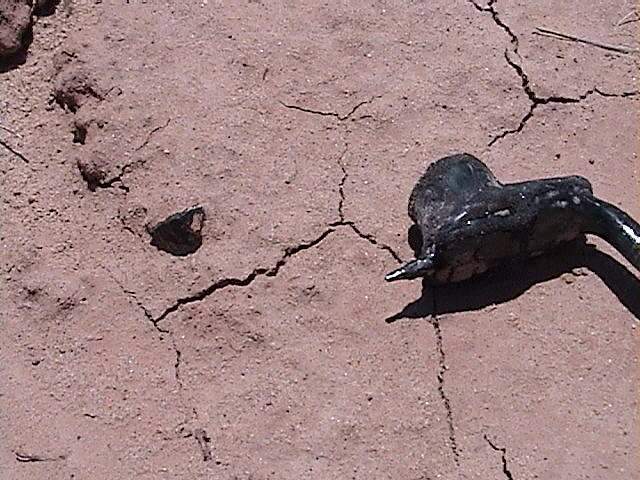 After several loud detonations, approximately 16,000 mostly pea-sized stones fell onto the flood plain near Holbrook, Arizona, roughly in line with the Sante Fe railroad tracks. 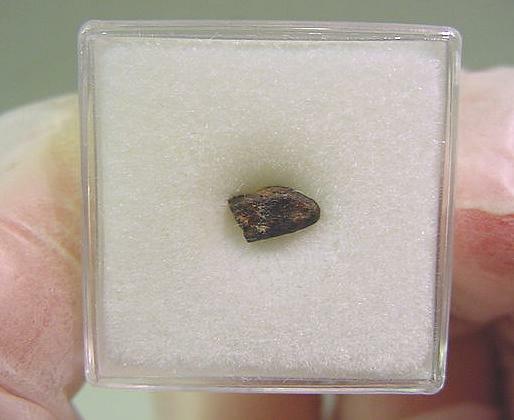 On 19th May 2001, myself, my 13 year old son Jamie and meteorite collectors Dave Andrews, Gregory Wilson and John Gwilliam set about finding more fragments and individual meteorites associated with this historic fall of L6 chondrites. It's pretty much like searching for a needle in a haystack now because the strewnfield has been thoroughly searched in previous years, although the rains do still expose new specimens. 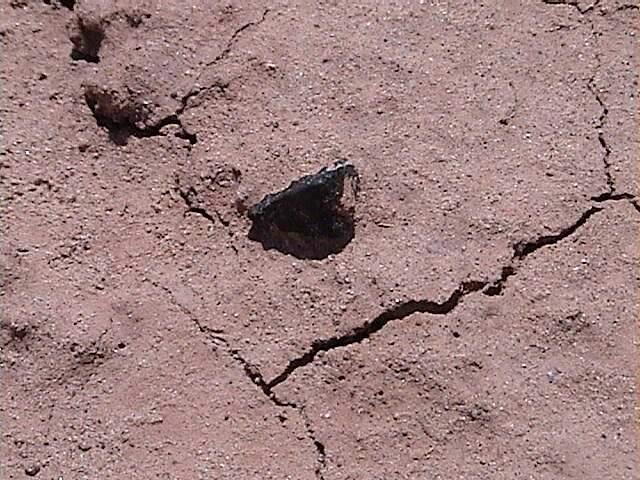 This was my second visit to the strewnfield and over the following 4 days I found my first ever Holbrook meteorite. This was an unusually cold day in the desert - a chilly morning with a strong, cold wind. In the afternoon, a violent thunderstorm with dark bands of rain and virtually constant lightning appeared on the horizon and slowly tracked towards us. With less than 30 minutes before the rain hit and we had to quit searching, I found my first ever Holbrook meteorite in this 0.8g fully crusted individual.....it was just sitting there on a shallow sloping dune waiting to be picked up! Finding the first Holbrook calls for lots of celebrations and a party in the desert. The rains had cleared by Sunday and the remaining days were all in the 80's and 90's. Two hours into the hunt, I found this beautifully fusion crusted individual on the side of a blow-out. We were all using magnetic canes during the hunt (metal detectors don't work well with Holbrooks) but this one was instantly recogniseable as a meteorite, so we took a few pictures of it embedded in the sand before lifting it out....the head of my magnetic cane is also pictured lying alongside the meteorite. This was my chance discovery which yielded perhaps 100 fragments in total. Just below a small bush, I found many highly weathered fragments lying right on the surface, firmly stuck onto the desert floor. I collected ~30 fragments from the surface weighing from around 0.2g to 7g within an 18 inch area, and a few more grams as small fragments, all in a line from as much as 20 paces away. 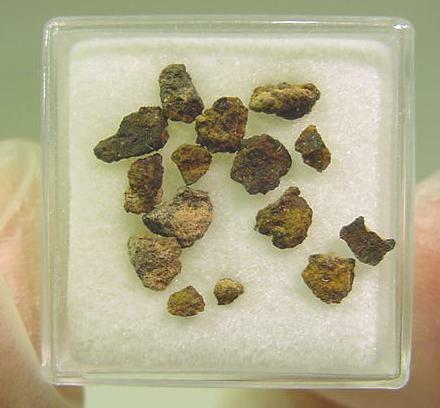 The matrix of each fragment is severely weathered, leaving spherical chondrules protruding from the surface of each piece. 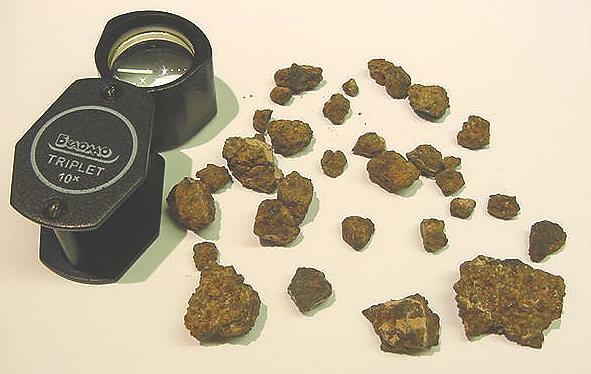 These all seem quite different in appearance to the much fresher individuals and fragments usually found at Holbrook....the chondrules are much more clearly defined (they don't very obviously resemble type 6) and each fragment has lost it's angular sharp points through long exposure and weathering. 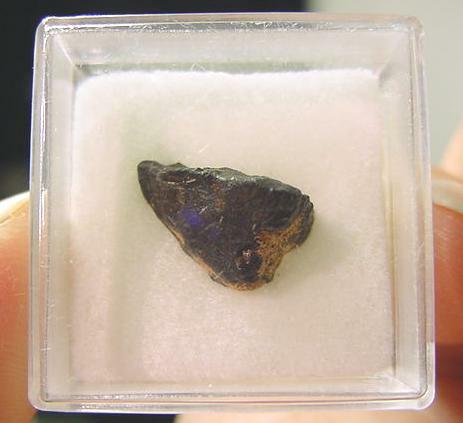 Maybe a new and different meteorite find??? ?.....probably not, but who knows??? Nininger found some ~1500g individuals in the 1930's that were reported as being very friable due to weathering, but it would be interesting to have these classified as they do seem so very different. We staked the area with a wooden post and flag so that we find the area again, and returned the following day with a sieve and shovel to excavate the area properly. I made no significant finds this day but picked up a few more fragments of the previous day's discovery at what was soon nicknamed "Rob's Honey Hole". These were mostly flakes and crumbs of fusion crust, obviously associated with yesterday's find but much smaller......many flakes of fusion crust no larger than the head of a pin were embedded in the sand everywhere. Armed with a sieve and shovel, John Gwilliam excavated the area and recovered one ~10g fusion crusted fragment from just below the surface and many smaller sub-gram fragments, in fact, everyone found several fragments with a little digging and sieving of the sand in a team effort. This was to be our last full day's hunting of the strewnfield, at least until after the monsoon rains and a future visit to the strewnfield could be planned. I found this tiny but perfectly fusion crusted individual in a blow-out fairly close to the railroad tracks. Searching so close to the tracks is difficult because the railroad embankment and roadway contains lots of iron-rich basalt that readily clings to a magnet cane, but this teeny individual clung firmly onto my cane and was ripe for a closer inspection. It was too small to authenticate visually and I had forgotten to bring my magnifier, so I ground a small corner with my diamond file. The interior was light coloured so I kept it and later studied it under x10 magnification. Through the eye glass, it was clearly another Holbrook individual and I quickly regretted having ground off a corner!! After a short break for lunch (beef jerky and chocolate) and swigging another few more gallons of water to stave off dehydration in the desert heat, we headed out to search another large blow-out. 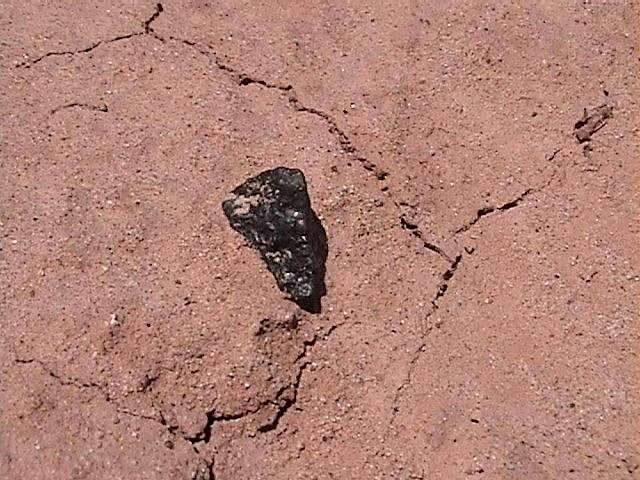 Within 15 minutes, I found this 99% fusion crusted nose-cone individual firmly stuck to the hard-baked sand. 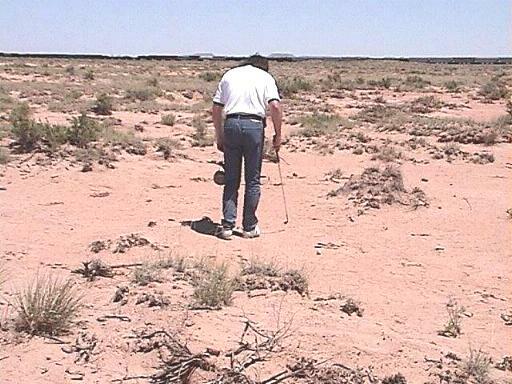 In fact, it was so firmly imbedded into the sand that it took a large plate of dry, crusted desert floor along with it when it leaped onto my magnet cane. 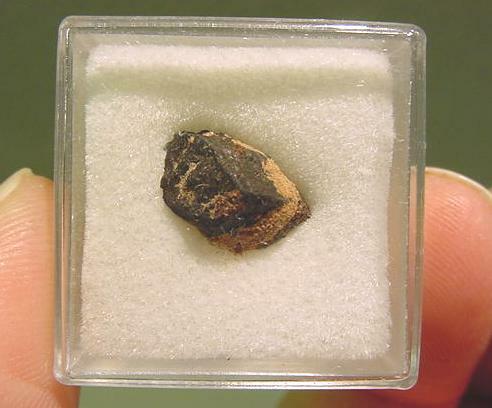 The small dark fragment stuck onto the sand in the upper left of the image appears to be a flake of fusion crust that's broken away from the uppermost point of the meteorite. Day ? - sometime in the 20th century - afternoon? 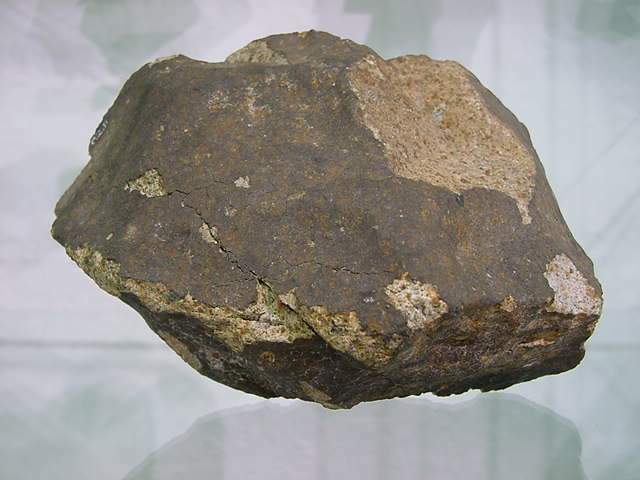 This is not a personal find, but a large 2.24kg Holbrook individual that I've had in my collection for about a year - previously part of the Monnig collection at T.C.U. and prior to that it was a Ward's Natural Science piece. 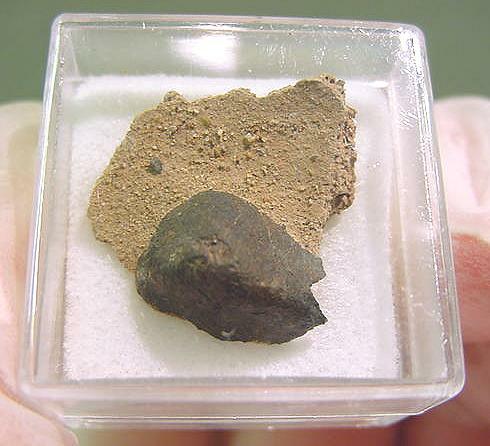 It kinda puts my small recoveries into perspective but nothing beats finding your own meteorites! !